The only one of its kind, this legendary creature that emerged from deepest France was a mainstay for goods transport in Europe for many years. Sixty-five years after the birth of the van version, it still lives on in our memories. Developed after the Second World War, the “2CV” version was unveiled at the Paris Motor Show on 7 October 1948 at the Grand Palais. Visitors will hold their breath when they discover the new Citroën which was internally classified as a “TPV” (Toute Petite Voiture or “very small car”) – a vehicle that was nicknamed “four wheels under an umbrella". The car stood out by utterly refusing to compromise. Its curious appearance was disconcerting – rustic to the extreme. In short, the 2 CV was the source of a whole wave of stormy controversy. The press railed against this "ugly duckling": only one publication liked it… all the others disapproved of it. And yet, designed by Pierre Boulanger (who had taken over as Citroën’s CEO after the death of its founder), the small car was a ray of sunshine in a France that was still licking its wounds just after the end of the Second World War. It was ideal for getting as many people on the road as possible. Designed to neither be noticed, nor to seduce… away from all the hustle and bustle of the fashion world, devoid of all labels in a society that was obsessed with status, the 2 CV quickly won people over from all social classes. By 1950, delivery times for this car that was only available in grey had stretched to six years. But that didn't stop Citroën from launching a van version – the second and only variant of the 2CV – in March 1951. Small tradesmen and public service workers were loyal to this small-sized van, which proved to be the most economic utility vehicle available on the French market. 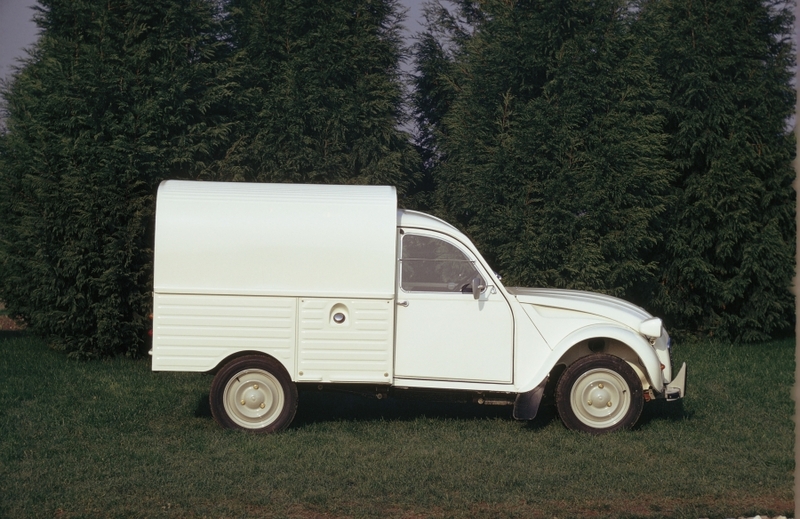 Its specifications were exactly the same as those of the 2 CV, but it had a rear section made of corrugated sheeting that was the same as the sheeting that featured on the Type H van. It had a capacity of 1.88 m³ and could carry loads of up to 250 g.
Although the twin-cylinder 375 cc engine could still deliver 9 hp, its gears were lower than those of the saloon version, giving it better acceleration. The 2 CV van also had a top speed of 60 km/h. Citroën had obviously thought of everything: its little utility vehicle that went on sale in spring 1951 had two separate seats, so the passenger one could be removed if needed. Similarly, it featured two separate rear doors. In the autumn of 1954, the twin-cylinder engine gained an extra 3.5 hp. More changes were to come. The AK400 was launched in summer 1970, and featured a number of improvements: its maximum load was increased to 475 kg, and the dashboard got more sophisticated. Although the 2 CV continued to be manufactured in Levallois up until February 1988, the last van version rolled off the production line in 1981. 1968… What a lovely month of May. 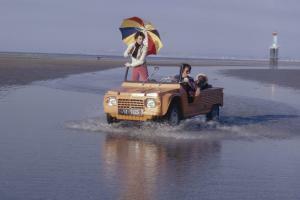 While students were pounding the Paris pavements, while "peace and love" was establishing itself as the slogan for a whole generation, Citroën was at the seaside, busy unveiling a curious vehicle based on the Dyane 6: the Méhari. The car was a leisure vehicle ahead of its time. At ease driving over sand or through fields and featuring plastic bodywork with articulated doors, it looked like nothing else. The passenger compartment was ultra-simple and had been designed so that it could be washed by hosing it down. The car's chassis and its 28 hp 602 cc engine were based on the 2 CV. The Méhari was launched in 1968 and was available for Fr.6996. Under a special scheme that applied to utility vehicles, the VAT on it could be reclaimed. Citroën also sold an optional removable windscreen and a number of different soft-top models. The Méhari enjoyed an extremely long life: it was finally retired in 1987 after nearly 145,000 of them had been manufactured. Citroën has just released a successor to it, powered by an electric engine.